MARCHANT BIRCH, Director/Choreographer Marchant was born and raised in Cape Town, South Africa. He has been living in England since 2000. Trained from an early age in Ballroom and Latin American, he is a much sought after performer and teacher both in the UK and internationally. Marchant has acheive success with a number of different dance partners over the years. He was winner of the Best UK Dance Act award at the UK Salsa Congress 2006 with his then partner Miriam Oppel. His ‘Take Five’ show also received high acclaim from the mambo king himself, Eddie Torres. At the UK Congress 2007 he received an award of recognition for his contribution to salsa and for raising the standard of teaching in the UK. 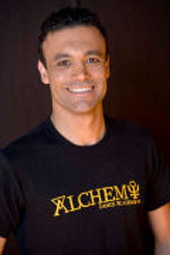 As well as founding the dance company, Marchant also started Alchemy Dance Academy in 2006 which provides the opportunity for the general salsa public to improve their dancing by way of the Alchemy method of dance training. It is pioneering the Alchemy Way that is now Marchant's main focus with his partner Davina. In 2007 they released their first instructional DVD 'Alchemy Way Partnerwork'. Their most recent project has been the opening of Alchemy Dance Academy at its permanent base in Hampshire. "I would like everyone to experience dancing in such way where they hit that zone or Dynamic Equanimity. It’s a feeling of Oneness where you, your partner and the music become one, and rhythm is the glue to unify all three. You can’t even feel where your body ends and your partners body begins, you don’t even know if you are leading or following because everything is one. In that state, no forceful leading is necessary, you are both just flowing, and the energy is just flowing. I’m not even sure if the brain gets involved because the brain can get in the way of feeling. That is what I wish for everyone to experience."